I find it amusing that the site itself, when viewed on my iPhone, is not “optimized” for iPhone viewing. That is, you have to scroll around and navigate the page just like a “full size” web page. Which works really, really well on the iPhone, so it’s not a big deal, but still, I chuckled. As far as what apps are listed, of course the “big” ones like Facebook and Digg are included. I also discovered the iPhone versions of Fandango (for movie listings and tickets – we needed this one!) and WeatherBug. These two are quite useful, and nicely done, and I hadn’t heard of them before. Besides that, I found the rest of the apps to be, well, boring and derivative. I guess I’m jaded. But I’m honestly disappointed that this is the best that Apple could do to harness the creativity and genius of people out there who WANT to write great apps for a great device. You’ll also find links to Apple’s documentation on iPhone web app development linked from the page, and you can submit your own web app for consideration/inclusion in the directory. And there’s an RSS feed to subscribe and receive updates when new apps are added, though I’m getting a “page not found” error for the feed right now. Guess no web site launch is perfect. 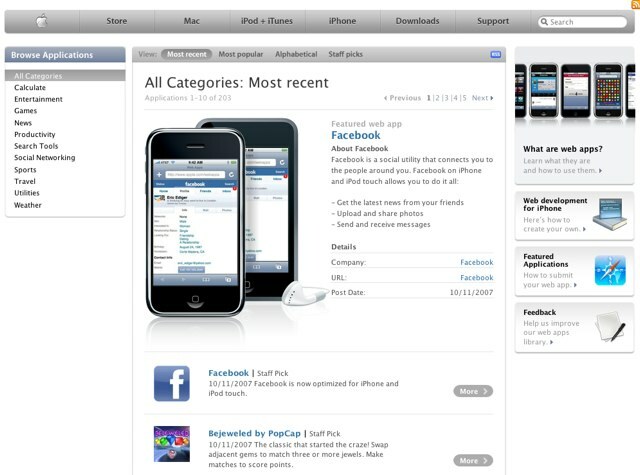 If you boomark these web apps on the ipod touch, will they be on the home page? If you mean home page as in the initial widget screen, the answer is, “no.” You just bookmark them. Most are somewhat customizable. Your settings are saved in a cookie on your touch. Thou web-based, the ones you like can become quite helpful. Once bookmarked, there is no more typing on itty bitty keyboard. Some, like news gathering apps, are linked to multiple sites.